Outdoor Entertaining & Summer naturally go hand in hand, but keeping it creative & stylish can sometimes feel like a chore when you are always using the same patio set, solo cups & paper plates. – Not that we don’t enjoy a good solo cup every now & again, but here are a few ideas to turn your next Outdoor Party into an Outdoor Soiree! 1. 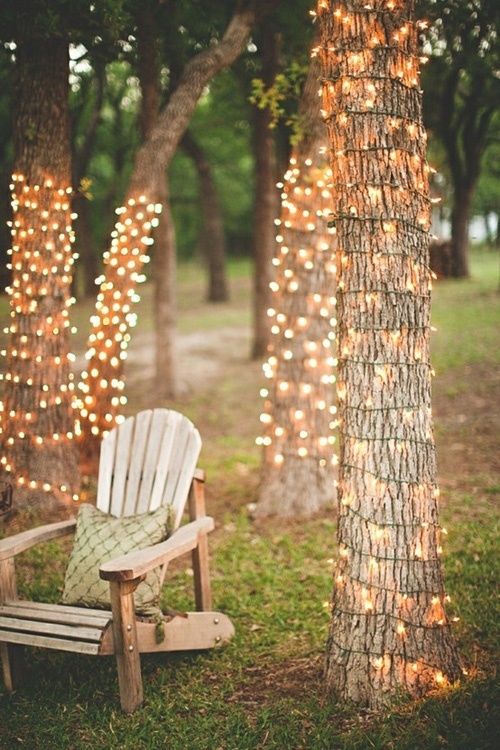 Setting: Instead of always using the same location, why not take the party into the actual yard or side of the house? Bring out indoor furniture & table cloths (weather permitting) to add a layer of unexpected elegance. Mixing up a variety of chairs gives a more relaxed and eclectic look. And simple folding tables are instantly dressed up with overflowing table cloths. My best tip for inexpensive table cloths are to use flat sheets. If they puddle on the ground it gives it a much more luxurious look. 2. Lighting: Twinkle lights are not strictly for Holiday Decorations anymore. Incorporating them into party decor is a great way to add ambient lighting. Rather than lining the rooflines, keep it casual & simply wrap a grouping of trees or deck rails. 3. Comfort: The main drawbacks to outdoor celebrating are the bugs & the heat. 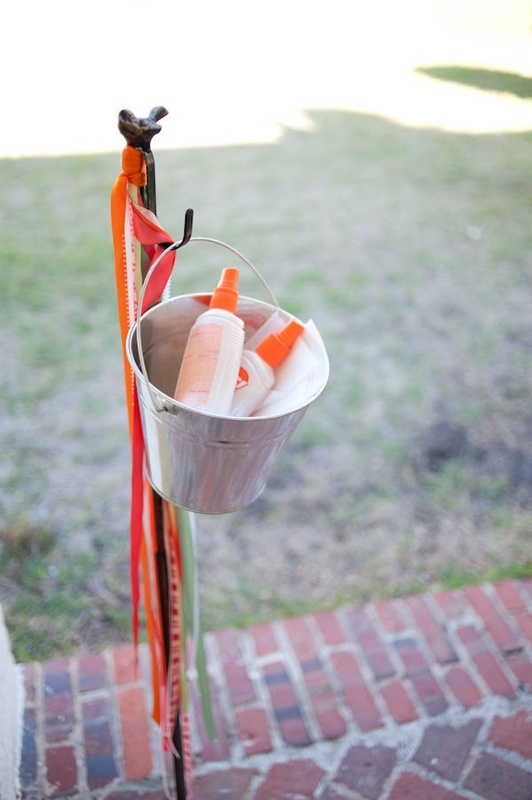 Keep a dedicated space of bug spray & sunscreen for your guests to use if they so choose. 4. Buffet: While the majority of us don’t have a dedicated buffet station outdoors at all times, pulling a buffet together can be easier than you might think. 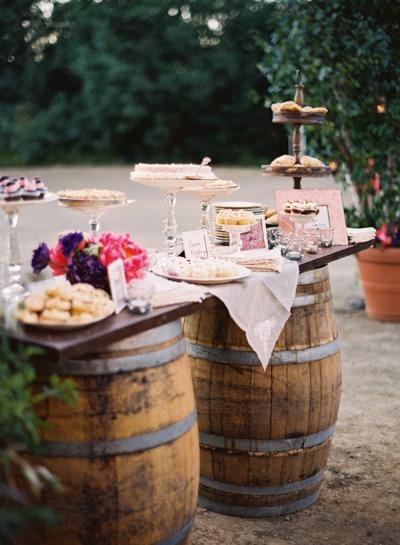 This simple buffet was merely constructed of two barrels and a slab of wood. This could also be done with an old dresser that you have lying around or again… table cloths work wonders on folding tables. 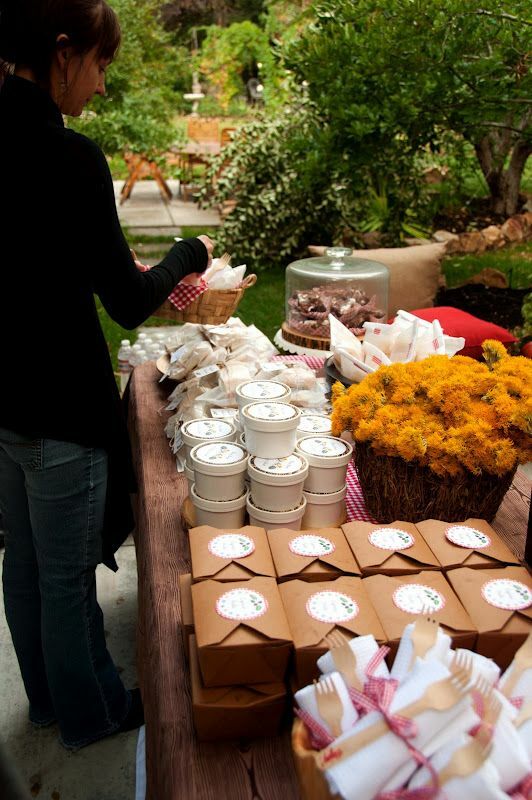 Another great idea for an outdoor buffet is to create pre-packaged options so guests can easily pick up what they want & go. 5. Beverages: Just like the buffet, I am a firm believer in grouping your food & beverages in separate tables at separate locations. 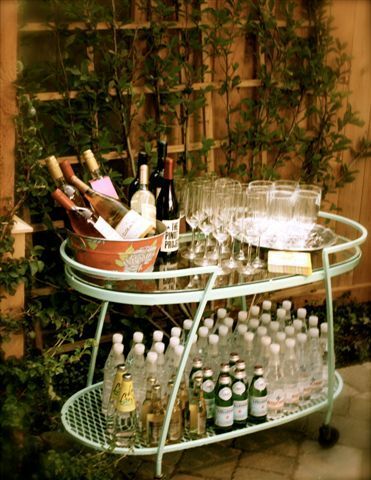 This keeps your guests from grouping in only one location & allows those who are only after one item to avoid a line. While having bottled & canned options are easy to grab, cocktails can keep a host running instead of enjoying their own party. To solve this, create one or two signature cocktails in large batches (with back ups in the fridge!). 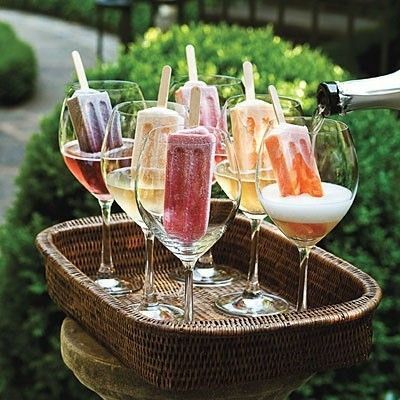 You can also bring interest to Champagne by adding in a Fruit Popsicle. These will give a fruity flavor to your champs as well as aide in keeping it cold on those hot summer days. 6. Dessert: While a full dessert buffet can add lots of variety, presentation can take a simple dessert to the next level. 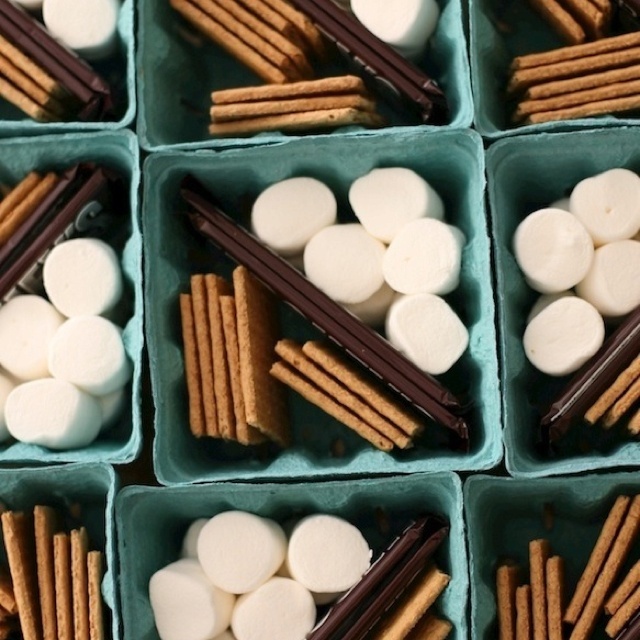 Creating simple smore kits using berry baskets is a chic way of displaying this classic outdoor dessert. 7.Entertainment: Not an every night event –but wouldn’t it be wonderful? 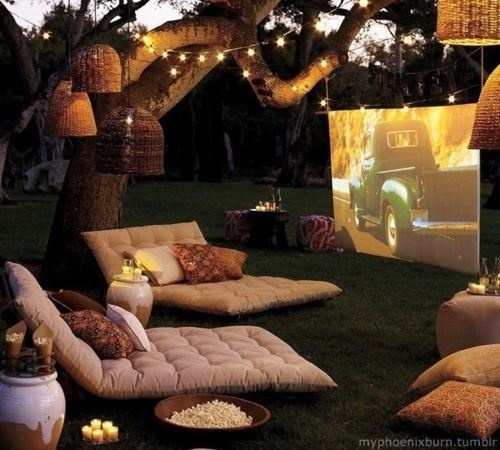 !– to create your own Screen on the Green in your backyard. 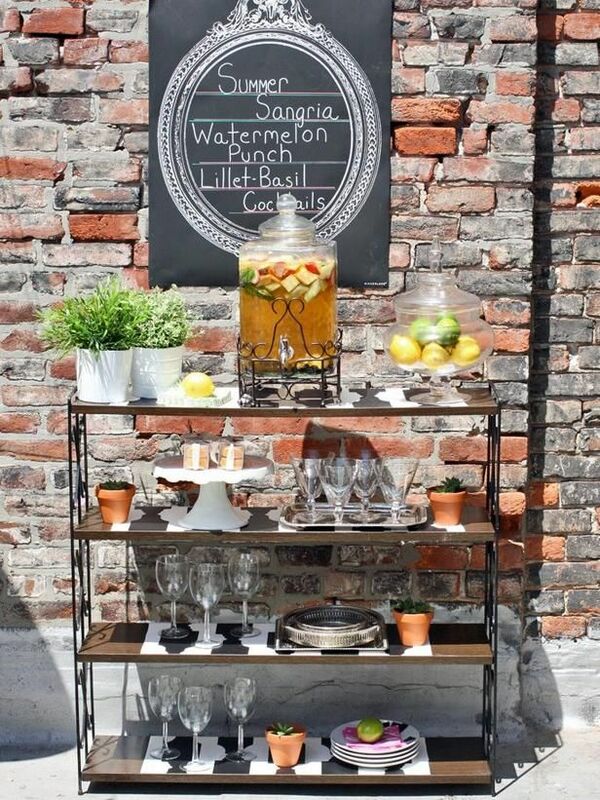 By incorporating a few of these into your next Outdoor Party you are sure to be the Hostess with the Mostess! Kudos to Kristin’s lovely tip collection. Her angle is oh so right. Every suggestion is great. Yes you can expect to spend several hours creating and playing with the party preparations. And at the party you’ll enjoy yourself so much more collecting the compliments and looking at a pretty party you are proud of!